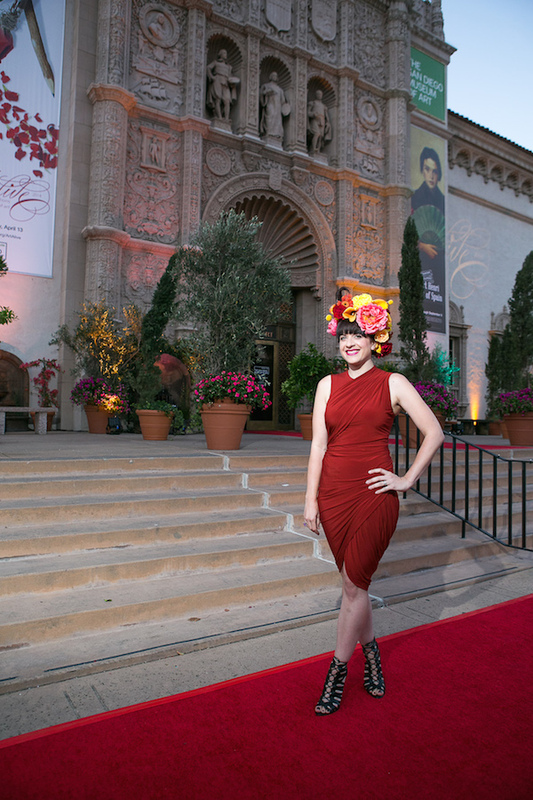 Today I’m profiling Sarah Grossman, the San Diego Museum of Art‘s manager of special events and stylish lady behind some of my most favorite events in the city, from Culture & Cocktails, the quarterly soiree themed to a new exhibit (i.e. “Havana Nights for new Cuban artwork acquisitions), to the upcoming Art Alive, a weekend-long exhibit during which florists reinterpret works of art via plants. I attended Art Alive’s opening event, Bloom Bash, last year, and it was one of the coolest events I had ever been to, and not just because the floral works were impressive. People go all out with their ensembles, which makes for great people-watching. I remember seeing a svelte, near-octogenarian shimmy around the dance floor in a tight sequined dress. Go, mama! With an eye for all things artistic and fashionable, I wanted Sarah to share a peek into her museum-planning life. Today she talks about wearing heels constantly and her favorite vintage shop…among other things. 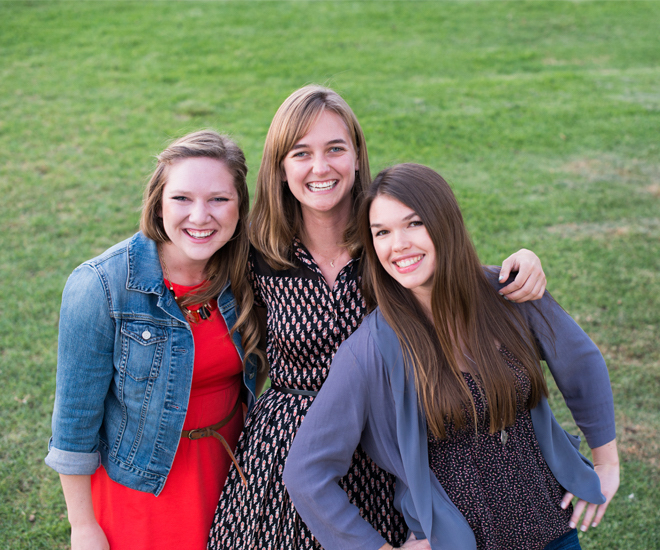 Today all three gals chime in on breakfasts, mental blocks, and more. In January 2013, I was fresh to San Diego, knew maybe two people, and was relearning how to drive after years of New York City life (for real). My technique for fighting this fish-out-of-water feeling? Attend networking and creative events like it was my job because, hey, I didn’t have a job anyway. One of the first events was a San Diego fashion blogger meet-up at the W Hotel, and it was there that I met the lovely Paulina, a financial analyst who moonlights as a fashion blogger over at Lil Bits of Chic. She was so sweet and welcoming, and in these past two years and I run into Pau all over town at events. It’s always such a joy to see her smiling face. 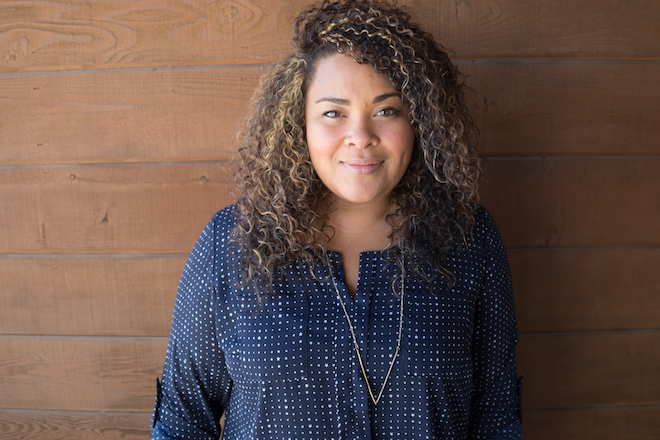 Today the born-and-raised San Diegan talks about the book she’s re-reading and the place that makes her get all the “I love San Diego” feelings…among other things. 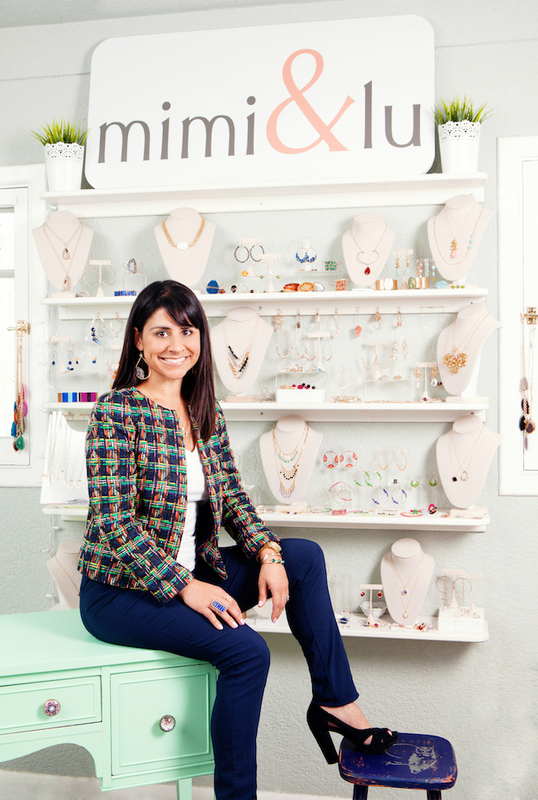 For jewelry designer Michelle Watson, it all started at Cirque du Soleil. More specifically, it started backstage, where she worked behind the scenes in props and wardrobe at the famed Canadian circus company. It was there that the performers kept asking Michelle where she got her self-made jewelry, and the idea for an official jewelry line came to life. 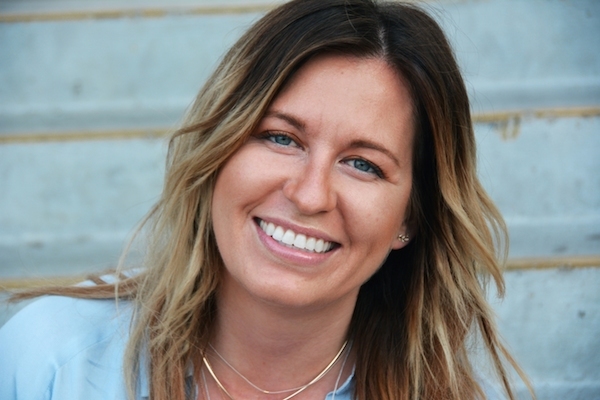 Today Michelle talks about her love/hate work relationship and being a city girl at heart…among other things. Plus, read a head for a giveaway and special discount for My SoCal’d Life readers! 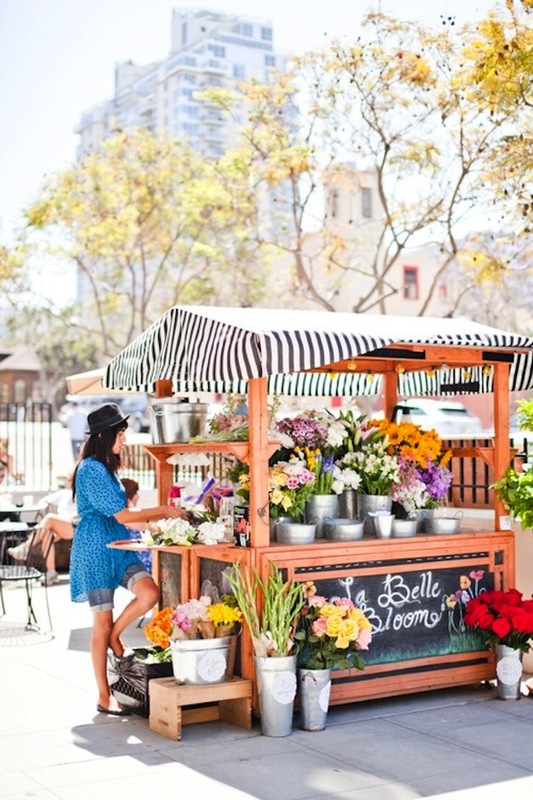 A European-inspired flower cart bursting with bright blooms smack dab in San Diego’s Little Italy—could there be anything more charming? 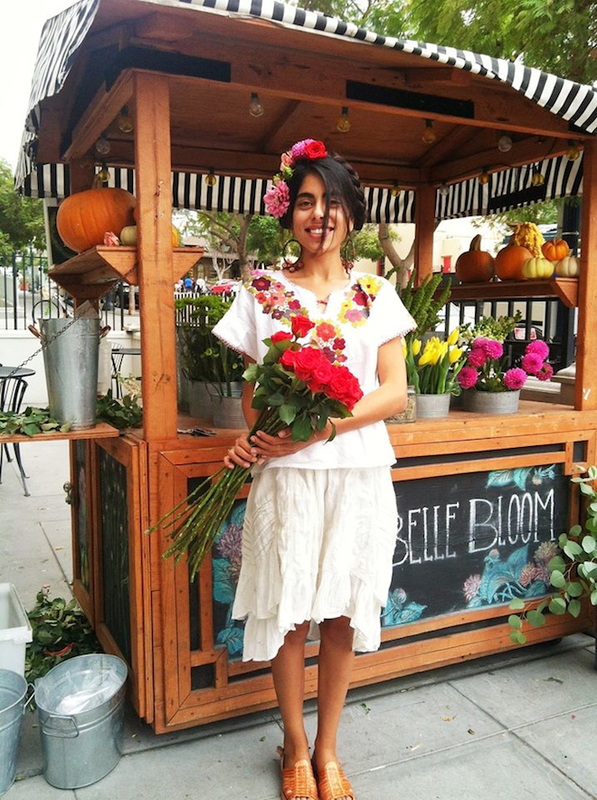 That’s the idea behind Claudia Cruz’s solo flower operation, La Belle Bloom, located in the pedestrian-friendly ‘hood, where customers become friends and people-watching is a wonderful perk of the job. But Claudia’s also a very in-demand floral designer, creating custom arrangements for special occasions (ahem, Valentine’s Day) as well as weddings. In fact, she designed the flowers for one of the recent weddings I blogged about in my side gig as a blogger for Exquisite Weddings‘ The Bride Suite. Oh, and she makes a killer Frida Kahlo costume, no? 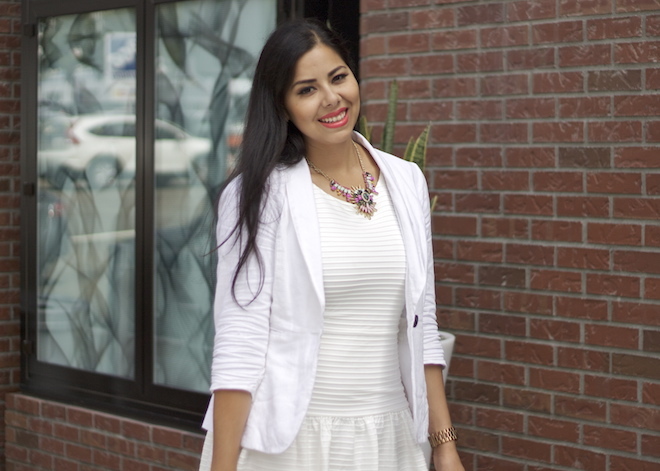 Today she chats about chilaquiles and finding peace in tall buildings…among other things. This morning I ate chilaquiles (fried tortillas with a spicy sauce) with mushrooms and avocado. I’ve recently gotten into waking up early enough to make and enjoy a good breakfast! Best thing about my job is getting to work and play with flowers all day, it really doesn’t get old. Having friends and regulars come by and have a coffee and a chat. I also love crazy go, go, go days (hello, Valentine’s Day!). Interestingly the thing I like least about my job is being a business owner. You take your work home with you, there is never an OFF button. It’s also scary to never really know what kind of a sales week/month you will have. The only way I can really tackle a creative block is to walk away from a project. Sleep it off and when you are ready, talk to people because even if they are not in the same creative industry, they have insight to offer. I am currently reading Twelve Patients: Life and Death at Bellevue Hospital by Eric Manheimer, M.D. which are true stories by told by a doctor at Bellevue Hospital in New York about patients he has helped or failed to help. I love hearing/reading stories about people’s lives. I am also reading Mexico: The Cookbook by Margarita Carrillo Arronte. There is an entire section dedicated to sauces and salsas! What’s your favorite spot in San Diego and why? Anywhere in the city. I get a sense of calm when I am anywhere within the confines of the big buildings, it’s odd to describe. I’ve felt this way since I was in middle school and learned to ride the bus and could go anywhere I wanted! Downtown was always it. This is cheesy, but I am so so thankful for the opportunity to be alive. And an even bigger bonus, that I am healthy! Totally and completely priceless. Thanks, Claudia! You can also find her on Facebook, Instagram, and Pinterest. A culinary ode to Beyonce is what first caught my eye. An appreciation for food that’s equal parts beautiful and ooey-gooey comfort was the other. I stumbled upon both in Holly Haines’ Instagram feed, and that’s how I knew this was a gal I should be following. Holly is a self-proclaimed “foodmaker” who shares her recipes on FMITK (From My Impossibly Tiny Kitchen) and has been featured on FoodandWine.com, thanks in part to her wildly popular Pretzky Bun recipe (a pretzel meets a sticky bun). If that shouldn’t give you a clue about her creative twist on things, then take a look at this Beyonce-themed dinner party she cooked up. Drunk in Rub chicken wings, anyone? Today Holly talks about why feeding people is so special and people-watching…among other things. Coffee. I’m horrible at eating breakfast, but it’s something I’m trying to work on this year. Experimenting with different flavors and spices, then getting to share those experiments with the people I love. Feeding people is my higher vibration. The food fails. Nothing hurts more than looking forward to a dish and having it turn out horribly. I usually meditate. Or try to focus on something completely different—that’s when a spark of inspiration usually happens. The Professional Chef—it’s the textbook used at the Culinary Institute of America. There are so many technical terms I have yet to learn! My favorite spot is anywhere with delicious coffee and people-watching. Waking up and breathing. The day exists, and so do I… that’s awesome enough for me. Thanks, Holly! You can also find her on Facebook, Instagram, Twitter, and Pinterest. Kate and I first met on a press trip, and soon after we exchanged info, we realized we had a lot in common—a love for travel, writing, natural beauty, and healthy eating. I know, one could say you can throw a stone and find people like that in Southern California, but I really connected with Kate’s thoughtful, meditative style. She seemed smart, focused, and talented. A quick glance at her excellent writing-photography-DIY site, and you’ll see that all of the above rings true. In the spirit of the new year and healthy starts, you should check out her inspiring post on her daily wellness routine and details about a book she’s writing (!). And in the spirit of my 7 Questions With series, Kate talks about the opposite of a creative block and why her North County neighborhood is so dang special…among other things. Homemade banana ice cream with dates and cacao nibs. Being creative. Everything that I truly want to do comes back to that feeling of being a kid again when all I did was draw and make up stories. Now I take photographs and write stories. I put a lot of pressure on myself, which is something I need to work on. Honestly, I rarely have a creative block. I have the opposite problem where I think of way too many projects I want to do. So, for me, I have to tackle decision-making and really only choose projects that deep down I want to do as opposed to what I think I should do. Just finished Wild. Loved it. Now I want to do something drastic and crazy in 2015. Hands down, Leucadia. This place reminds me of my childhood in Ventura, CA. Can’t beat the laid-back vibe. Hmmm, the fact that I’m here in beautiful San Diego, that I have people I love around me and that I haven’t given up on my dream. Thanks, Kate! You can also find her on Instagram, Facebook, Pinterest, and Twitter.